Are Web Apps the Future of Mobile? Here’s a fun game to play. When you’re next gathered with a few tech-savvy folks, ask them what the future of mobile is. There’s no definite answer, of course, but see how many suggest Web apps. I’m guessing the answer will be none, so you may be interested to hear the story of Koa.la: a VC-backed, photo-sharing startup that today announced a pivot to focus on Web apps, primarily for chat messaging service Kik. 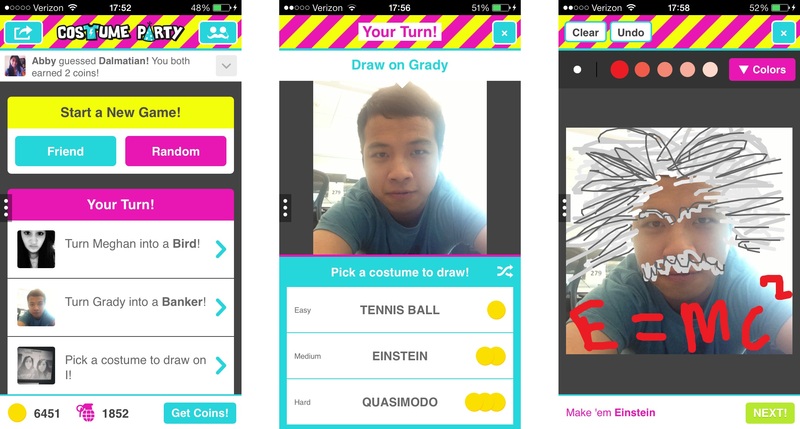 The move comes after Costume Party, an HTML5 app that Koa.la built on Kik’s Cards content platform, surpassed one million downloads within 24 hours. The app playfully connects users with existing and new friends by letting them draw on each other avatar’s using a Draw Something-like guessing game. Costume Party currently boasts over four million users, 500,000 of which are active per day, and that success has seen it go from being a side project that the startup — before today known as Albumatic — worked on, to the company’s full-time focus. Kik has been growing like the proverbial weed of late. Its registered user base (the company refuses to disclose active user numbers) was 30 million this time last year when it launched Cards, a platform of apps and content based inside the app — tripling that figure in 12 months is an impressive feat. Cards quietly opened to third-party developers in recent weeks — as we noted last week — and with Zynga having already selected it for its mobile messaging debut (a notable win), its testament to Kik’s vision that Albumatic has switched its focus entirely to cater to Kik and its user base. I asked Gundry and fellow co-founder Adam Ludwin why they picked Kik ahead of more lucrative game platforms on other messaging apps — Korea’s Kakao Talk grossed $311 million from gaming alone in the first half of this year, while Japan’s Line racked up $53.7 million from in-game purchases in its last quarter of business. The Koa.la founders say they considered Line, Kakao Talk and popular Chinese messaging app WeChat, but found that these Asian services operate “like ad networks” and are “fine for native apps” that developers have built already. In contrast, Kik doesn’t offer an SDK that is loaded into existing apps. Instead it provides APIs and an HTML5 platform that makes building content from scratch easier and less time consuming. But, more interestingly, Gundry and Ludwin say Kik’s platform is lighter and more focused on one-on-one interactions, which helps give their games a unique audience. By that they mean unlike Line/Kakao-powered games — which let users interact with the friends in a way that is reminiscent of the classic Farmville/Zynga/Facebook mass-messaging craze of recent times — Kik leverages its social graph to allow users to play head-to-head, as is the case for Costume Party and other Card apps on the service. Equally, discovery is different too. Apps are found and loaded from inside the Kik app, which means no time-consuming redirects for App Store/Google Play downloads like the Asian chat services. All that engagement is impressive but for now there’s no revenue. Koa.la says it is running small scale experiments using in-app purchases and advertising and so far “the numbers monetize as you’d expect” from native apps. The startup, which currently has a headcount of eight, says it is aiming to reach 50 million Kik players and gain “a better understanding” of its audience and the platform before it begins properly monetizing its apps. So there you have an early case for mobile Web apps. Livingston believes that other companies will follow suit and support HTML5-based content so the risk of putting all the eggs in Kik’s basket — which he naturally puts down as being minimal — will be offset by the ability to port content between services in the future. The Cards platform is still in its early stages but with a big name like Zynga aboard and one startup pivoting entirely to focus on it, there are already some testimonials. As it stands currently, SDK-based games platforms are more popular and lucrative, but Livingston envisages a time when the mobile Web is “viable” and works just like it does on the desktop. What’s for sure, is the wave of messaging apps is presenting developers with new channels to supplement or indeed replace app stores. Where this goes, it will be interesting to see. 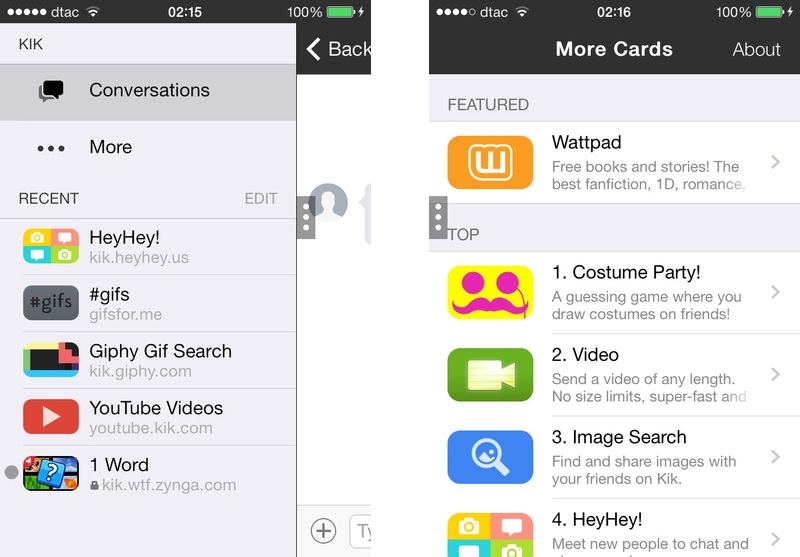 Developers can get full details about Kik Cards on the dedicated website here.